Chenin Blanc, W.O. Breede River Valley. Fairtrade. Wine of South Africa. An iconic South African white wine from Fairtrade vineyards in the Breede River Valley. 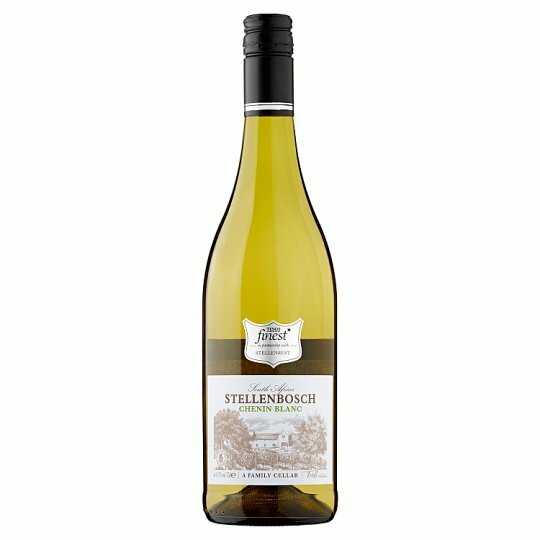 Aromas of apricots, apple and honey are followed by elegant flavours of ripe pear and a subtle hint of oak. Best served lightly chilled with seafood, creamy chicken or mild spicy dishes. The grapes were harvested at 22-23 balling sugar with about 3-6 hours of skin contact. After settling, the wine was fermented at 16 degree Celsius in Stainless steel tanks. Wines was racked from fermentation lees and treated with bentonite before cold stabilization. All actions prior to filling was done with utmost care to avoid any form of oxidation. The Breede River Valley region offers a wide range of microclimates and terrains for grape cultivation. From the higher altitude mountain slopes with its rocky and stony soil to the valley floor running along the Breede river with mainly alluvial soil. A Mediterranean climate dominates this region, with temperatures colder in the winter and hotter in the summer than in the more coastal regions of the Western Cape. Do not drink when pregnant(logo).Drinkware(logo).Know your limits(statement).